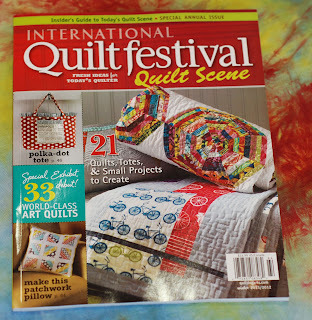 Studio Jules Art - Blog: IQF Quilting Scene Give Away! I just can't contain my excitement about my "Truck Quilt" being a part of the International Quilt Show Quilting Scene magazine! I'm in such a stitch about it that I just have to share it with you. Starting right now, I am having a GIVE AWAY of a copy of the publication. Here are the rules. Post a comment on my blog with your favorite fiber or quilting technique. On Wednesday night, November 2nd, I will put all the comments in a container (probably made of fiber, no doubt) and my precious little Studio dog, Cosmo, will pick the winner! Oh, don't worry, he is up to the challenge, as long as I give him a treat! So, make those comments, I can't wait to read them! 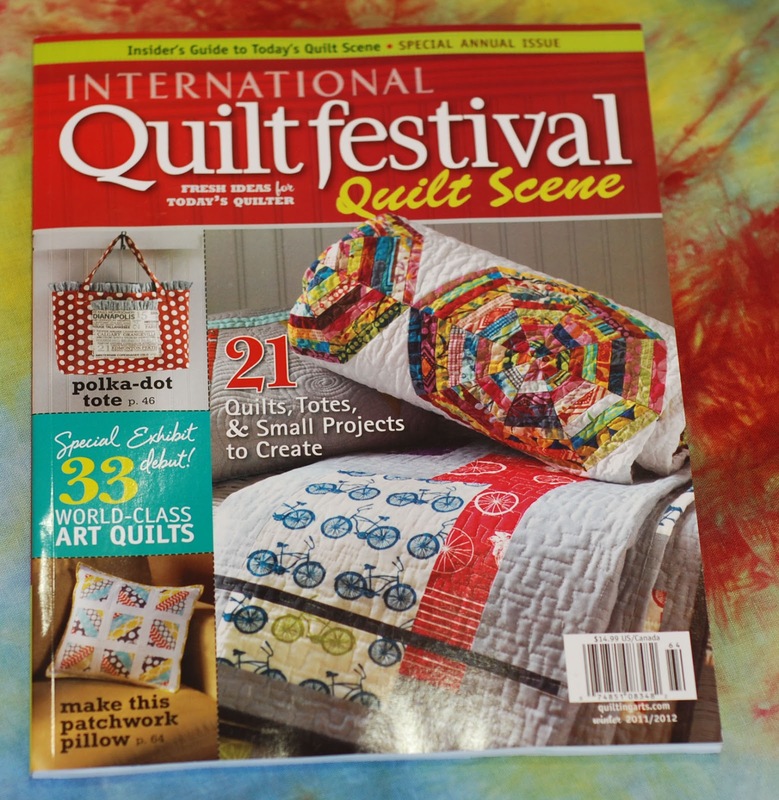 For those of you who (or is it whom) already have the magazine, my quilt is on page 37! In case you haven't already figured it out dear readers, my favorite fiber to include in my art quilts...painted or dyed cheesecloth! Jules...that is so exciting!! I wish I had been able to get to Heather's last Sunday, but not enough hours in the day...I am going to be going to Houston on the one day whirlwind bus tour so will get to see your quilt in person!! And I will bet the Festival Book also!! not sure if this counts, but my favorite thing to do is dye fabric. maybe i'll even use it someday! My favorite quilting technique is to add a few (or more) hot-fix crystals to the finished quilt. My bag is traditional quilts but I plan to make collage quilts in the future using old pieces of lace, fabric, buttons, etc. Congratulations on being published in the magazine. That's quite an honor. I enjoyed meeting and talking with you at Larkin's class a couple of weeks ago! My current favorite "fiber" is beads! I would love to use dyed cheese cloth. I think I'll try it soon. Right now my favorite new thing is to use my pinking shears for intricate edge cutting on fabric to use for layering ground cover or leaves. Somehow intricate and pinking shears shouldn't be used in the same sentence, but it seems to have a wonky effect that works. I love thread painting, adding highlights to a printed flower or free-motion quilting on a beautiful hand-dyed background. Enjoyed reading about your time with Sandra Sider--you lucky quilter you! Congrats Jules! Fusing with raw-edge quilting is my favorite technique today, but it could change tomorrow!! Tell Cosmo if he picks me there will be an extra surprise in his Christmas stocking!! Congratulations on being published (twice!) and good luck in Houston at IQA. I know your interview will go great! My two favorite techniques for art quilting are using variegated quilting threads and adding embellishments. I like unusual objects, and hardware, as well as beads. Jules! How exciting! As I do not have your creativity, I am quilting the traditional way with good quality cotton. I just love the feel of a good piece of cotton.